In some housing markets across the country it may feel like you need to be a millionaire just to buy a home. This is truer in some cities than in others, like San Francisco where Census Bureau data shows the median home is worth over $1 million and comes with sky-high monthly mortgage costs.. Below we look at data on the home-purchasing habits of $1-million-earning-households to see where millionaires are buying homes. In order to find the places where millionaires are buying homes, we looked at data on two metrics. We looked data on all home purchases made in 2016 and compared them to all home purchases made by households earning at least $999,000. Check out our data and methodology below to see where we got our data and how we put it together. Millionaires buy (relatively) more affordable homes – Relative to their incomes, millionaires take on smaller mortgages compared to the average homebuyer. According to our data, the average millionaire homebuyer has a mortgage-to-income ratio of 0.71. That number for the average homebuyer is 2.55. California is most popular state for millionaires – California leads the way with five metro areas in our top 10 and seven in our top 15. The Census Bureau shows California has the second-highest median home value of any state in the country. California is also home to many millionaires. Plus, in some California metro areas you need to earn six figures just to afford the average home. This leads to a higher proportion of millionaires buying homes relative to the population. Anyone who rents or pays housing costs in San Francisco-Redwood City-South San Francisco probably won’t be surprised to see this metro area top the rankings. Overall about 9,040 homes were bought here in 2016, and 158 of those homes were purchased by households earning at least $999,000 per year. Even residents earning $1 million per year took out sizable mortgages in this metro area. The average household earning at least $1 million per year took out of a mortgage of $3.06 million. The Bridgeport-Stamford-Norwalk metro takes second. Our data shows that most homebuyers here are wealthy. The average homebuyer, for example, had an annual income just shy of $200,000. Of all the area’s homebuyers, just over 1.5% earned $1 million in 2016. Those buyers took out an average mortgage of $2.13 million. The second of five California metro areas to crack this top 10 is San Rafael. There were only 2,014 homes sold here in 2016, compared to 8,878 in Bridgeport-Stamford-Norwalk, Connecticut. Of those 2,014 home purchases, 1.34%, or 27 of them, were made by millionaires. Millionaires here tended to take on less debt to finance their home purchases compared to the average homebuyer. Millionaires taking out mortgages here had a mortgage-to-income ratio of 1.52 compared to 3.17 for all homebuyers. The largest metro area in the U.S. takes fourth. There are around 20 million people in this metro, a large chuck of whom dream of one day owning a home. Of the 79,400 homes purchased here in 2016, 798 of them went to millionaires. That means millionaires made roughly 1% of all home purchases, the fourth-most in the study. This metro area also has the fourth-richest home-buying millionaires in our top 10. The average home-buying millionaire had an income of $2.02 million, according to our data. Millionaires bought 507 homes in Los Angeles-Long Beach, California in 2016, according to data from the Consumer Financial Protection Bureau. In total that is equivalent to 0.9% of all home purchases. Millionaires did not tend to take out large mortgages in this metro area, at least relative to their income. The average millionaire homebuyer had a mortgage-to-income ratio of 1.29 in Los Angeles-Long Beach, California. The average mortgage-to-income ratio for all homebuyers in this metro area was 3.24. The Anaheim-Santa Ana-Irvine, California lies on the southeast border of the Los Angeles-Long Beach-Glendale metro area and is another popular spot for millionaires to buy property. According to our data, millionaires bought 0.76% of all homes sold in this metro area in 2016. The average millionaire homebuyer here had an income of $1.8 million and took out a mortgage of $2.32 million. West Palm Beach-Boca Raton-Delray Beach, Florida starts a string of two Florida metro areas in this top 10. This metro area is home to the second-wealthiest millionaires in our top 10, on average. The average home-buying millionaire here took home $2.24 million in 2016 and took out a mortgage of $2.35 million. That gives them a mortgage-to-income ratio of 1.05. In total, millionaires represented 0.75% of the home-buying market. Miami millionaires are the richest in our top 10. The average millionaire who bought a home in Miami-Miami Beach-Kendall took home $2.3 million in 2016. That is just under 20 times more than what the average homebuyer in this metro area earned. Overall, millionaires in this metro area made up 0.69% of all homebuyers. The Boston metro area takes ninth. The average homebuyer here seems to be feeling the pinch of expensive homes. The average mortgage-to-income-ratio here is 2.7. Millionaires on the other hand take out much smaller mortgages relative to their income. The average millionaire in Boston who bought a home had a mortgage-to-income ratio of 1.02. In total, millionaires made up 0.68% of homebuyers in this metro area. 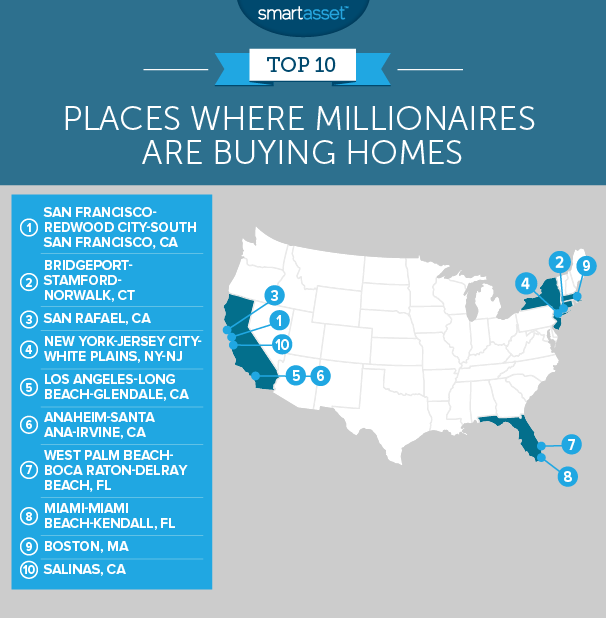 Our list ends in Salinas, California where about one out of every 200 homebuyers was a millionaire. Homebuyers who were millionaires here took out mortgages worth less than their annual income, on average. In total, the average millionaire homebuyer had a mortgage-to-income ratio of 0.83. In contrast, the average homebuyer in Salinas had a mortgage-to-income ratio of 3.19. Total home purchases by households with an income of at least $999,000. In order to find the places where millionaires are buying homes, we divided the number of home purchases made by households with an income of at least $999,000 by the total number of home purchases. We than ranked the cities from highest to lowest based on this number. For the purposes of this analysis, we only included data for metro areas which had at least 10 millionaire homebuyers. Data for both metrics comes form the Consumer Financial Protection Bureau’s Home Mortgage Disclosure Act and is from 2016. Start saving early. It’s important that you have a down payment already saved before you buy your home. Putting down 20% of your home’s value is the typical recommendation. But by putting more than 20% down you may be able to get access to better mortgage rates and lower your monthly mortgage costs. Watch out for the extras. Regardless of if you are a millionaire or not, it’s important you buy a home you can afford. Most of your housing payments go to your mortgage, but you also need to keep property taxes, homeowners insurance and closing costs in mind. Those costs can add up and if you’re not careful you may end up buying a house you can’t comfortably afford. Don’t forget to negotiate. The sticker price of a home is not set in stone. Depending on the market you are in, it is possible to negotiate with the home seller to get a lower price. And if they will not budge on the price, you can negotiate other costs, for example who makes a needed repair on the house or who pays the closing costs. But be careful if you are negotiating over a home and you are in a seller’s market. It is possible if you spend too long negotiating, someone else will swoop in and meet the seller’s demands.